In this post I am sharing tips on how to stay motivated when learning a new language. Learning a new skill is always a daunting task at first and this is especially true when you want to learn a new language. Where to start and how to stay on course? What I mean is figure out why you want to learn the language. Is it for a planned holiday? Do you need it for your studies? Do you need it for your job? Do you want to learn your partner’s language? These are all different overall goals which require different approaches and time scales. For a holiday you could do a short course teaching you the main phrases, essential grammar and vocabulary. If you need it for your studies an intensive course over a few months would be more appropriate. If you need it for a job you will set aside a lot of time and keep learning. The same is true if you plan to plan to relocate to the country whose language you are learning. If your partner is, for example German, then you already have a major advantage, but you still need to agree with your partner that you have to stick to speaking German at specified times. This is not always easy! From experience I know it’s far easier for me to just speak English with my husband than to explain things. Once you know your why and your goal – try visualising it. What would it mean to you if you were able to communicate in your chosen language? Create a vision board if that helps you along the journey and put it up somewhere where you can see it every day as a reminder. Your timescale depends on your goal of course. If, for example, you need the language for your next holiday, then figure out how many weeks or months you have to learn until then. There are plenty of short courses on the market designed for the holiday maker and they are often sold with a CD or downloadable audio file. If you attend a language course with the goal of learning the language for your studies or job, then usually the course dictates the time scale. Most courses are taught over an hour or two once a week and can take a whole academic year. The advantage of such a course is that you learn with other people who are also new to the language – the downside may be that you only get limited opportunities to speak, because you learn in a big group and the tutor can’t give you enough attention. When I studied Art History the requirements for the course were to have four and half years of Latin (we call it das grosse Latinum – the big Latin), French, English and another language. I didn’t have French and wanted to study Italian at university, so I attended a French intensive course at the Institut Francaise for two months. I got the certificates, but still can’t speak the language because I didn’t really use it much. After two terms of studying Italian I gave up – the course was taught every day for one hour to a group of about 100 students. There was no way I would get the chance to speak the language. 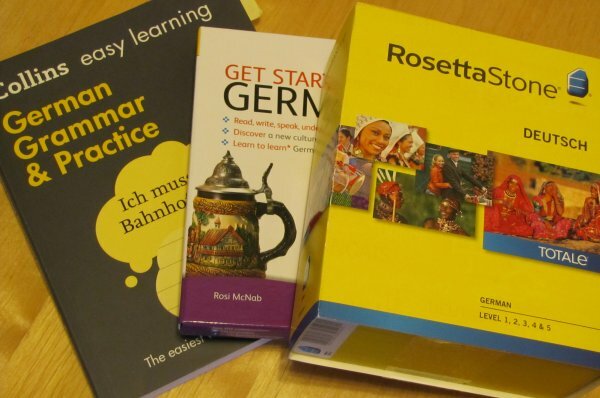 German grammar book and two self teaching courses. Set up a realistic time table for yourself. Once you know how long you have to learn your chosen course, set up your time table. Little and often goes a long way. Instead of choosing one day when you work for two or more hours and cram it all in, it’s better to set aside 30 to 60 minutes each day or every other day. Ideally at the same time each day, so you get into a learning routine. Tell your friends that you are learning a new language and the goal you want to achieve. You are more likely to make an effort when you make a public announcement that you can’t get out of. This could be someone who learns the same language, someone who learns a different language or a friend who happens to be a native speaker. Check in each week to report on your progress. If you have a partner who is a native speaker try to have conversations with him or her in your chosen language. Hire a native speaker for speaking sessions. Learning on your own can get boring and frustrating – especially when it comes to actually speaking the language. From experience I know that my students find speaking German incredibly hard, not because they can’t do it, but they feel embarrassed and lack the confidence. However, confidence comes with practice. A tutor provides the safe space you need as a learner to speak, make mistakes and gain confidence. Reward yourself for small successes. Yes, you read that correctly. A success could be as simple as to just stick to your timetable, finally figuring out how to conjugate some pesky irregular verbs or getting through your first chapter of your course book or managing the alphabet. Make your language learning more interesting. Learning from a course book can get very dull and sometimes you just need a change of learning material. I recommend to my adult students to check out the books by Andre Klein. These are books of short stories which are aimed at the beginner. 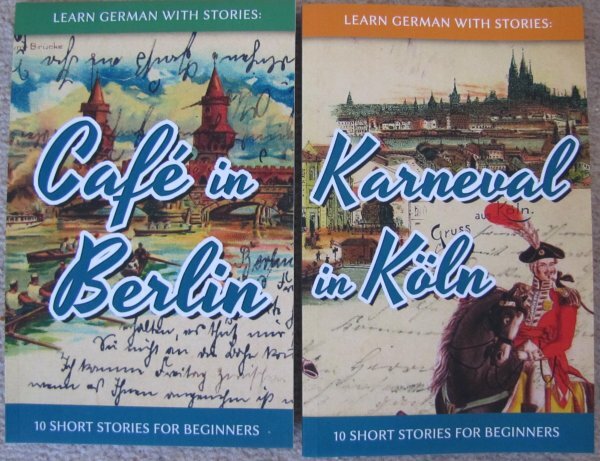 One book I have is called “Karneval in Köln” another one is “Café in Berlin”. The books contain 10 short stories with a vocabulary section and a quiz at the end of each story. You can find the series on Amazon. I also recommend to watch German movies or TV series, explore German comics, listen to German radio, read German children’s books and German newspapers. I have created a whole blog series of “Great ways to learn German” which you can find here. Choosing something that you are genuinely interested in is the key to make your language learning more fun. Similar to rewarding your small successes it’s also a good idea to celebrate your bigger language achievements. Be proud of what you have accomplished when you order your first Kölsch in a Cologne pub. I hope you found these tips useful. Enjoy your learning experience. ← The 4 cases in German – Part 4 – The accusative case.